From the archives of Rock Island’s First Lutheran Church comes this rare Real Photo postcard of one of its early buildings. 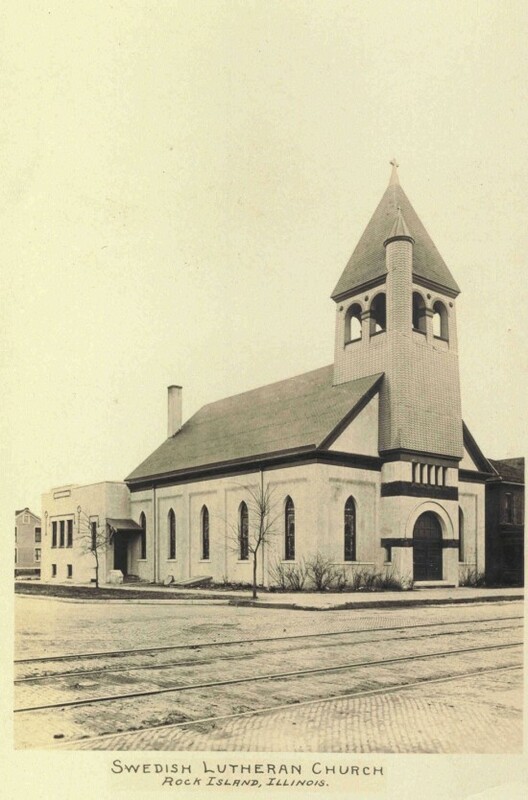 It was located on the southwest corner of 14th Street at 4th Avenue and was then known as the Swedish Lutheran Church. Most of the information in today’s story comes from church histories and new research by First Lutheran’s current pastor, Rev. Gregory Mayer, and his wife, Judy. The Rock Island church organized in 1870 with a first-year membership of over 100 including 24 children. Prior to that time, Lutherans of the Augustana Synod had to travel to Moline to worship. In that same year, a frame church was built at 904 8th Avenue. Vintage photos show a modest, gable-roofed building that looked like a one-room school. A round-topped doorway was centered on the short gabled street end and plain, round-topped Italianate style windows lined the sides. As the congregation grew, more space was needed. A lot at the corner of 14th Street and 4th Avenue was purchased and a second church, this time in brick, was completed in 1887 at a cost of $5560. In 1895, the 25th anniversary was celebrated by making improvements to the church. The interior was frescoed (plastered), new pews were installed, and exterior sidewalks and stairs were laid. Another improvement in 1907 replaced the formerly plain church windows with art glass. During the early years a small Sunday school building sat at the rear of the lot. It was replaced in 1913 with a large attached annex. Our postcard shows the annex, which was stucco with Craftsman style ornamentation. The brick church was also covered with stucco, which reached its height of popularity in Rock Island in that era. A new $10,000 pipe organ was also installed. During ensuing years, improvements and maintenance occurred as necessary, with many new donated interior furnishings. In 1924, the Luther League presented the church with a large altar painting of Christ in Gethsemane by local artist Carl Grafstrom. As early as 1935, plans to erect a larger church building were being considered but a site was not acquired until 1948. It was a five-acre hilltop estate, complete with an 18 room Prairie style home and huge carriage house, located just north of 18th Avenue, between 17th and 20th Streets. The mansion, constructed by Stuart Harper and his wife Grace Velie Harper, had been described in the 1907 year-end edition of The Argus as “stucco, graceful in style of architecture” and had cost them $35,500. Two years later, the Harpers sold to Irvin S. and Margaret White who renamed it “The Lindens” because of the linden trees in the surrounding woods. The estate remained in the Harper family until 1943, when it was sold to John and Margaret Scheuermann for only $17,500. The Scheuermanns sold it to the church for $50,000. The congregation immediately set about converting the carriage house to a church. The magnificent Prairie-style house was left largely unchanged, although its second floor was remodeled to enable its use as the parsonage. The ground floor and basement served as the parish house, a site for Sunday school and other activities. That use continues today, although the home is no longer used as the parsonage. What became of the two former church buildings? The 8th Avenue church was sold and used as a public hall, as a synagogue, as a theatre, and finally as a feed store. It was demolished in the late 1920s. The postcard church is still standing although changed. It was sold to the Salvation Army who used it for many years as a church. After several years of retail use and vacancy, it is now the home of Orr’s Mortuary. The most striking difference between the postcard picture and the building of today is in the loss of the unusual tower with its single corner turret. The lower 20 feet of the 50-foot tower was brick with remainder frame construction. The original tower covering appears to have been shingle-shaped metal. The other significant change is the addition of large “picture” windows on the east side of the building and covering of front window openings. The old 1907 art glass remains in the unchanged upper sashes. A new side entrance has been installed where there was formerly a cellar door. It is interesting to note that today’s paint placement, with bands of contrasting color on the front and highlighted details on the rear addition, are placed in the same manner as on the postcard. Even the small niche beside the front door is in place. There is one thing that First Lutheran church is missing today — the Grafstrom altar painting, which was left in the old church for the Salvation Army. After religious use of the building ceased, the painting was removed to an unknown place. If you know its whereabouts, it would be welcomed home again. This article by Diane Oestreich is slightly modified from the original, which appeared in the Rock Island Argus and Moline Dispatch on May 2, 2004.